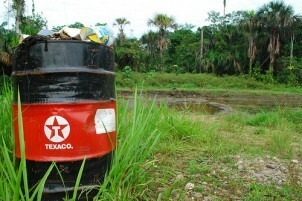 On 3 January 2012, an appellate court in Ecuador confirmed an earlier lower court decision that found Chevron-Texaco guilty of a wide range of damages linked to their former oil extraction activities in Ecuador. The earlier 14 February 2011 court decision ordered Chevron to pay 18 billion US $ in compensations, or half that amount if they would apologize publicly. But after one of the longest environmental lawsuits in the world ever won by the victims, justice is still not for tomorrow. Chevron does no longer have assets in Ecuador to confiscate, it refuses to accept the ruling, and considers going to Ecuador’s Supreme Court or to other courts in the US. It is using hundreds of lawyers to not just defend itself but to attack judges, lawyers and plaintiffs in Ecuador and their allies in the United States. But in this case, David keeps on winning against Goliath. From 1960 to 1992, Texaco (later merged with Chevron) dumped nearly 17 million gallons of crude oil and nearly 20 billion gallons of drilling wastewater directly into the ponds in the Ecuadorian Amazon instead of re-injecting it underground. This lead to severe health damages, contaminated groundwater, spoiled soils, damaged fauna and flora, a lack of drinkable water and as a result cultural damages to several ethnic groups and loss of livelihood for indigenous and settler inhabitants . In 1993 a “class action” suit against Texaco was brought in a court in New York under the ATCA (the Alien Tort Claims Act). The company claimed that the US court was not the appropriate court to deal with the issue so in 2003 the case went to Ecuador (Sucumbios), as Chevron wanted. This finally lead to the court decision on 14 Feb 2011, argued in 188 pages, that forced Chevron to pay 18 billion US $ in compensation. Chevron appealed. This week, they lost their appeal as well. Sometimes states “criminalize” people or communities complaining against environmental threats or damages from mining, tree plantations or fossil fuel extraction, even calling them “terrorists”. At other times, companies in the extractive industries pay for armed mercenaries to intimidate those who complain. (See our previous blog post on Rio Tinto in Papua New Guinea and the many allegations against Shell in the Niger Delta). Chevron-Texaco is just refusing to obey to the law. Disregarding all the evidence of what happened in Sucumbios and Orellana in the 1970s and 1980s, disregarding the facts proven in two well documented court decisions (14 February 2011 and 3 January 2012), the company is currently pursuing a fraud case against the plaintiffs and their lawyers, accusing them, among other things, of faking evidence and bribery. It is also accusing the judges of corruption. This is unacceptable. In order to collect the damages, the Ecuadorian victims will pursue legal action against the company in other countries, such as Brazil or Argentina where Chevron has assets. Pablo Fajardo (the plaintiffs’ lawyer) announced in Quito on January 4, 2012, that the victims were more than willing to accept Chevron’s apology. This would reduce the sum to be paid for by Chevron to 9.5 billion USD. But with Chevron in deep denial, while no longer having assets in Ecuador, Pablo Fajardo said the plaintiffs would pursue the company’s international assets to assure the damages are paid in full. He said: “There are legal elements, international conventions and norms that allow for the execution of court decisions in different countries.” He also noted that Chevron grossed $240 billion in 2011 and reported profits of roughly $8 billion in the most recent quarter. In other words, they could almost completly compensate for the historic damages in Ecuador with the profits of one quarter plus an apology but instead they pay hundreds of millions to US lawyers. It remains to be seen if Chevron now relents and there is now a settlement or agreement. Otherwise, there are still a few years to go after a last appeal in Quito and attempts to gain access to Chevron’s assets based on the court decision in Ecuador. It also remains to be seen what the outcome will be in two other big cases against Chevron. One of them is for billions of dollars in Brazil because of a recent oil spill, another for what they did in Burma (or rather what Chevron inherited as liabilities from Unocal in Burma from damage to human rights). But what is already clear from this story is that multinational corporations like Chevron not only think they can just neglect the legacy they left behind, they also seem to believe that they are above the law. It is up to states to show they are not. If other countries with assets of Chevron stand with Ecuador’s victims and respect the international treaties they have signed, it might soon turn out that the decision taken on 3 January 2012 was a historic moment in the fight for environmental justice worldwide.